The Results Are In: How Soon After Graduation Did You Get a Job? 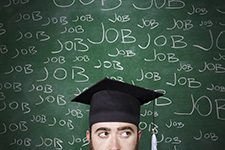 Education and experience are hot topics when it comes to your chances of finding a job. Since professional opinions are mixed on whether or not your education plays a primary role in your search for employment, we asked Movin’ On Up readers how soon after graduation they secured a job. While the largest majority of readers found a job immediately after or before graduation, those who found work a few months after graduation were mixed in their responses. According to the results of the survey, it could take anywhere from one month to one year to secure a job after earning your degree. Additionally, 16%, the second largest group of respondents to our poll, reported that they are still looking for a job after graduation. The results of the poll are a mixture of graduates who found work right away and those who are still looking after several years. While it’s easy to feel discouraged by long job searches, it’s important not to give up. Recent surveys from universities and other institutions suggest that hiring is on the rise for recent graduates, and there are ways you can help yourself stand out from the competition. If you got a job after graduation, what tips do you have for other recent graduates? Let us know in the comments section below!